Cinema Vivantis a celebration of imagination and innovation. Before World War I, European filmmaker Ladislaw Starewicz pioneered stop-action animation, creating a never-before-seen movie experience. A gifted storyteller who used the new medium of animation to illuminate his fantastic imaginings of the secret lives of ordinary objects, Starewicz has become an obscure cult hero. Two Starewicz films are featured in Cinema Vivant—The Cameraman’s Revenge, a charming piece about the marital troubles of beetles and The Mascot, an adventure story about lost toys. On the other side of the Atlantic, American Charley Bowers revolutionized the industry in the 1920’s by combining animation with live action. There It Is, a recently rediscovered film by Bowers, is a whimsical comedy about a mysterious occurrence investigated by Scotland Yard. This ensemble of accomplished and versatile musicians celebrates the music of Django Reinhardt and Stephane Grappelli’s pioneering Quintette du Hot Club de France with style and panache. The HCSF borrows the instrumentation of violin, bass, and guitars from the original Hot Club while breathing new life into the music with innovative arrangements of classic tunes and original compositions from the group’s superb lead guitarist, Paul Mehling. Featuring the amazing violin of twice GRAMMY® Award-winning Evan Price, the velvet vocals of Isabelle Fontaine and a swinging rhythm section, the group never fails to surprise and delight. To hear the ensemble live, or on any of their 13 albums, is to be carried back to the 1930’s and the small, smoky jazz clubs of Paris and the refined lounge of the famous Hotel Ritz. Often called gypsy jazz, the music of The Hot Club of San Francisco has entranced audiences around the globe for over 20 years. 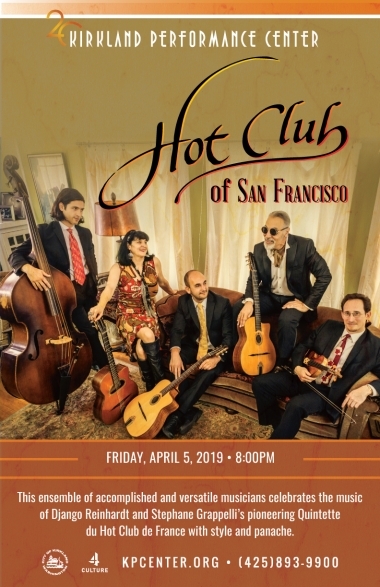 Acoustic Guitar has hailed the group’s playing as “intricate, scorching and often brilliant.” With frequent national and international tours — from Iceland to Lincoln Center and the Monterey Jazz Festival — The Hot Club of San Francisco keeps this historic music fresh and alive.